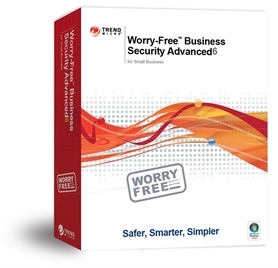 Worry-Free™ Business Security solutions provides businesses with fast, effective, and simple protection that allows for optimal use of their computers and servers. It provides effective protection that stops web threats before they reach your business machines while minimizing any slowdowns. In addition to PC security, the WFBS Advanced has integrated protection for Mac clients (iMacs and MacBooks) and servers, without needing to purchase and manage additional solutions. The latest Worry-Free Business Security solutions provide customized installation options, so you only get the security you need. With continuous updates—most of which are stored on the local security server instead of your business computers – new threats are blocked faster, which reduces the impact on your computers' performance.